As soon as it is dry, I'll seam and add closures. I'm still not quite sure what I want to do for closures. I have ribbon but it isn't too girlie. I may make a run to Jo-Ann Fabrics tomorrow. 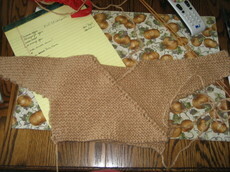 So, with the kimono off the needles, I was free of knitting projects...............for about two hours. I cast-on for Williamsro. 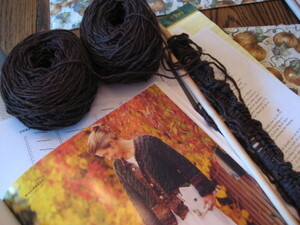 I've chosen Noro Cash Iroha in a dark brown for the main color and the 'border' yarn will be Noro Blossom which is a multi-color yarn, primarily in earthtones. Both yarns are held double and the cardigan will be knit essentially in bulky weight, though it doesn't *look* like a bulky yarn. This sweater is my first using charts and cables so I'm looking forward to working with them. I definitely need to wrap my brain around the charts. I joined the Square Deal Weave-A-Long this week. I was sucked in after clicking on the link at Stacey's blog. Then I saw all the cool and innovative things you could make with yarn and a small loom and I acquired a new obsession. Oh heck, what's one more? Of course, 4x4 looms are sold out everywhere but ebay. However, I was able to buy a 2x6 and a 4x6 loom from Brigitte at Bahr Creek Llamas & Fiber. I ordered them Friday and they came today! Whoo hoooo!! Now, that is outstanding....from both customer service and immediate gratification perspectives. I did mention obsession, didn't I? 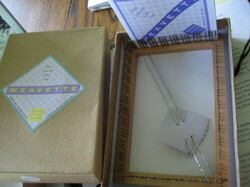 *ahem* I may have found a loom or two on that auction site, as well. But they aren't here yet. Now, I have to launch into the week one pattern of the WAL. Really, go look at Jana's site. She made the coolest knitting project bag with loom squares.